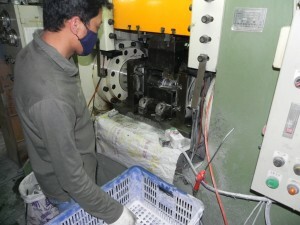 Bicycle component manufacturing is where the journey to the creation of a complete bicycle begins. A brand may assemble the units that end up rolling down the highways and byways. But the heart and soul of a bicycle is forged in workshops dotted over the landscape, from Tainan in the south to Taipei in the north. 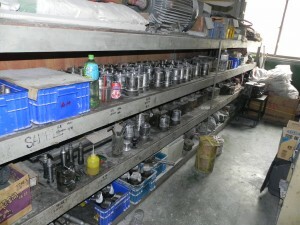 This post, then, is the first of two illustrated pieces offering a glimpse into most of what goes on in a Taichung county hubmaker’s workshop. The company, whose work I feature here, has carved out market space for itself through producing high-end hubs for quite some time. 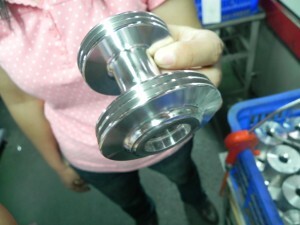 It’s very likely where the hubs on your own wheelset were produced. In this first post I’ll look at the creation of the hub shell. The next will deal with hub assembly and get to check out a very funky hub, the result of a recent ODM collaboration between the hubmaker and a European based customer. 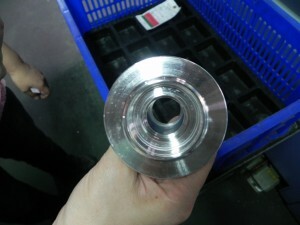 More than just a description of technical processes, this post is about an idea I want to begin to talk about, something I’ll come back to in the future in discussing other things: the relation of mass-produced or machined parts or components to hand-made/hand crafted items. Something I’ve been musing over for a while now, it has come into a bit more focus recently. If you have not already done so, I recommend a listen to Iain Boal’s talk given at Copenhagen Museum, recorded by Copenhagenize.com. In it he outlines some of the ideas going into his (soon to be published) book The Green Machine. (It’s not all what you think–the “Green Machine” has a not so green history). In the history of bicycle manufacturing coming after this cultural change we also have had the culture of the single craftsman alongside of this (Bianchi, Colnago, Pegoretti, to name some of many). Having spent so much time in components factories, I wonder just how far apart the cultures of the factory and the lone craftsman really are. Cold forge or CNC? (Forging processes for the enthusiast and enthusiast/professional). 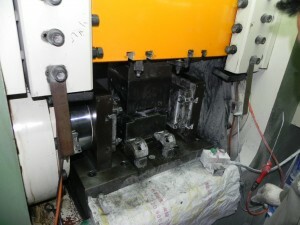 For large productions, cold forging is the way to go, with reduced cost-per-unit compared with CNC. Cold forge press. 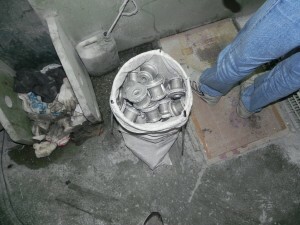 The operator is processing a batch of alloy hub-shells. The shell in focus here is middle picture, top third. Hub-shell is processed in two movements. 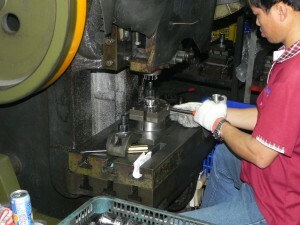 Here the operator is preparing for the second press. The shell is shaped according to the jig that is applied. There’s a jig for every occasion. Or, anyway, there can be a jig for every occasion. 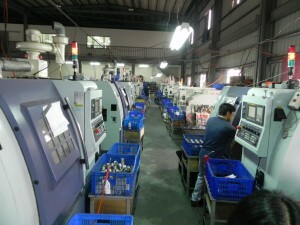 From here we head over to the CNC section. Having been processed, it is now recessed. This is when the threads are cut. Cleaning in preparation for another hub shell. Or, how about this one. What a transformation from this . . . This next one is especially interesting. 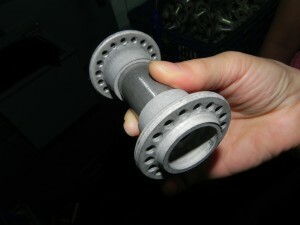 A hub shell originally consisting of 3 separate pieces is machined into one. 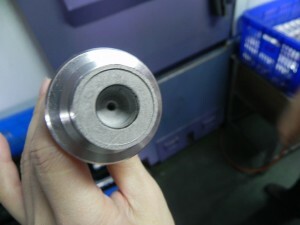 3 pieces are machined . . . The original concept was that machining 3 into 1 would be cheaper than cutting “the uncarved block”. It actually turned out to be the same. 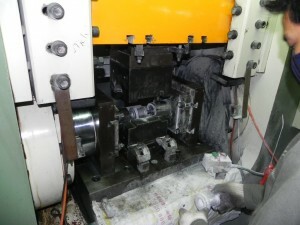 The customer has therefore decided to go back to simple machining of an “uncarved block” in the absence of technical or commercial advantage from this strategy. 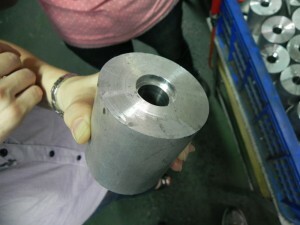 A basic issue here is that CNC-processing a small quantity is cheaper than cold forging. 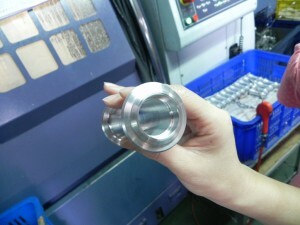 CNC is more expensive per unit, but cost-effective if you only have a small quantity. 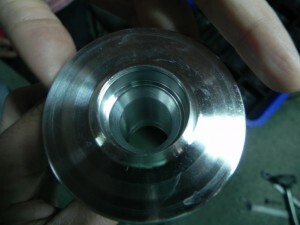 To go the path of cold-forging, you need to have your own jig (which brings in the problem of amortization) for the particular hub shape or design you want. You can get the design you want with the acrobatic CNC machine. One other process of note is the addition of spoke holes to the hub shell. 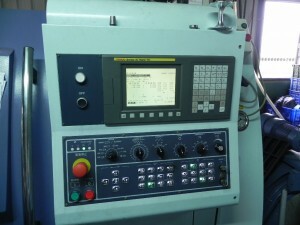 There are two machines, an operator on each. 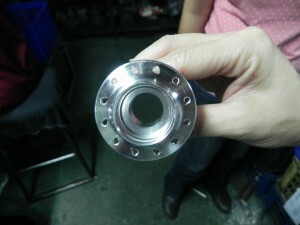 The holes are added from above; the hub shell is held in place below. And this is the result. If you look closely at this, you will see “keyholes” rather than circular apertures. Those are completed externally, not on site. 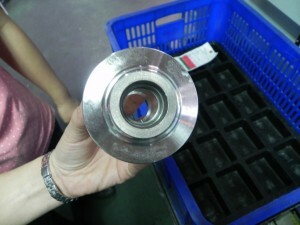 So that’s a glimpse into the basic processes behind the production of the hub shells in your bicycle’s wheelset. 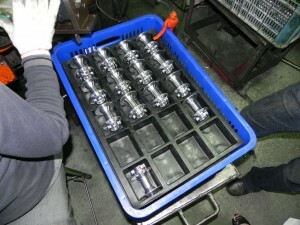 A bicycle’s components are crafted by specialists. Many are specialists due to the precision machinery and tools at their disposal, such as those few whose work we considered above. Others bring a higher level of skill to the products they fashion, which we will see in the assembly room, the followup to this post. Others still, particularly in decal application in the painting workshop, display an extremely high level of handcraftsmanship. This is also visible in the individualized attention that each frame receives in the frame maker’s factory. Basically I find that when you look very closely into the varied hands and varied processes that result in a completed functioning bicycle, any boundary between handcrafted individual artisan production and mass production for the mass market becomes less clear. As I mentioned earlier, it’s something I’ll come back to. As for the hub manufacturing outlined here, once this is done, then it’s off to the assembly line, which will be the subject of a future photo-post.